Fat, promising bud on March 31. 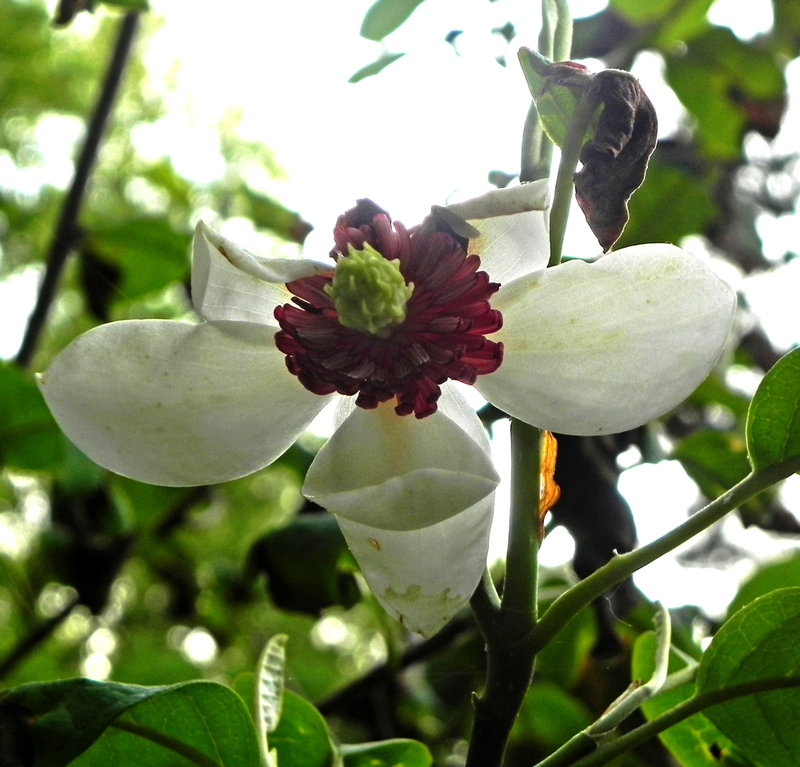 It’s exotic-looking but nowhere near as large as southern Magnolia, but Magnolia sieboldii certainly is something we don’t often see in the Midwest. We brought one home from South Carolina seven years ago and planted it in a spot we thought would be perfect—in partial shade with only morning sun. Its first summer, its leaves burned terribly no matter how much water we gave it. I chalked it up to youth and a limited root system. The following year I moved it to the edge of our oak woods where for the next several years it grew gangly but strongly in upward and outward directions. Fully open but missing petals. I discovered them on the last day of March—buds on several of the branches! We’d had such a mild winter and this was finally going to be the year it blooms, I thought. But then we had a couple of nights below freezing, and the more developed buds turned brown and most of the tree’s leaves became black and crispy. 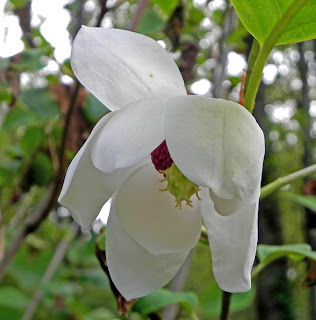 All of the information I’ve found on Magnolia sieboldii, also called Oyama Magnolia, contests to the difficult placement of the plant, which is more of a gangly shrub than a tree. Scorched leaves are common in a sunny location, but it’s not a pretty sight in a small garden. The spot it’s in now is uncultivated woodland with soil rich and on the acid side. A fresh flower showing a bit of its colorful center. 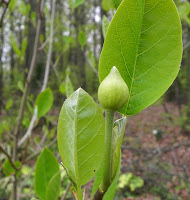 A promising bud in May. In the woods, this Magnolia is unobtrusive, even in bloom. 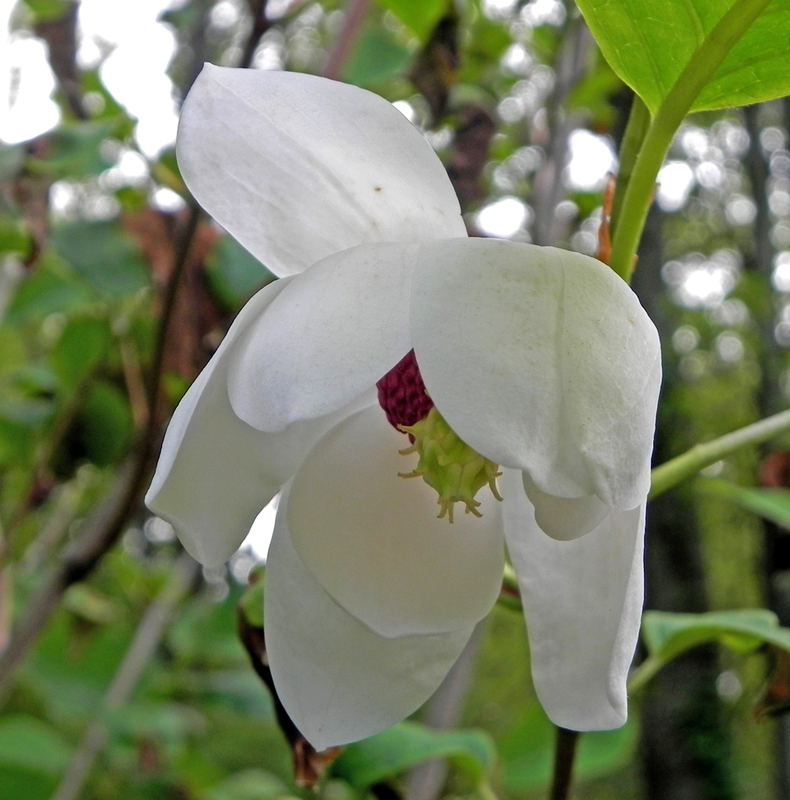 The novelty of getting it to bloom is exciting, especially in a Zone 5-6 garden. Is it worth the wait? I’ll answer that question next year when it blooms (or not). But for now as I post in this month's "You Can Grow That" series, I have to say I can't wait to see what happens next. And, for me, that's one of the best things about gardening.